She's not very nice, but she sure is entertaining! Artist Jim Shore captures the larger-than-life personality of Ursula in this handcrafted design. The theatrical villain's voluptuous octopus figure is sculpted from stone resin and hand-painted in a detailed scene with Ariel, Flotsam, and Jetsam. 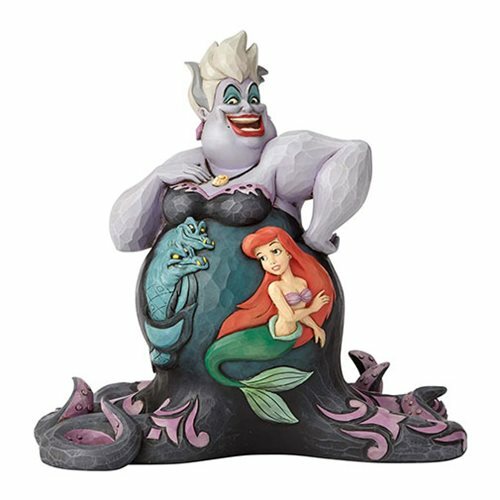 Measuring about 8 1/2-inches wide x 8 1/4-inches tall x 6 1/4-inches long, the Disney Traditions The Little Mermaid Ursula Deep Trouble Statue by Jim Shore adds quite a colorful statement to any display!